and installed 32bit Vista Ultimate on it. The problem is that if the machine goes to sleep, it starts buzzing when it wakes up. And I can't pinpoint where the sound is coming from. It could be the HDs or the mobo. But could be anything. The buzzing only happens after it wakes up from Vista's sleep mode. If I restart it, the sound goes away. If anyone can help me in any way, I'd appreciate it. Tell me if you need more info about the box. Also, I could try recording the buzzing. Re: Buzzing sound. Please help. I hate to ask for more description, but can you compare it to anything? How loud is it? Is it a buzz or more of a note? Any chance you could take the side of the case off and pin point it? Does the noise correspond to any other activity? No CD's spinning up or loose fans? I'm guessing you would have known if it was coming from your speakers, so I won't ask . Aside from starting when Vista wakes up, does it change when you run programs or even move your mouse? I've run into machines that produce faint noises when they are under any load. Larson wrote: I hate to ask for more description, but can you compare it to anything? How loud is it? Is it a buzz or more of a note? Any chance you could take the side of the case off and pin point it? Does the noise correspond to any other activity? No CD's spinning up or loose fans? I'm guessing you would have known if it was coming from your speakers, so I won't ask . It's not that loud, just loud enough to be annoying. It's constant - doesn't matter if I do something. I'll try getting a recording and pics of the box later today. Have you pinpointed the fact that the sound is coming directly from your Box? I used to have a creative soundcard that would produce a FULL VOLUME buzz when coming out of sleep mode in win98. It was so loud that it was still audible even when the speakers were turned down all the way. The problem would only go away if i restarted the computer. I'm 100% positive that this sound is not coming from the speakers. is the buzzing you are describing the high pitched whine? that was the most predominant sound in your video lol... just wondering. taptap wrote: is the buzzing you are describing the high pitched whine? that was the most predominant sound in your video lol... just wondering. I'll post a better before and after vid tomorrow. So you can see where I'm sticking the camera and the difference in the sound. It seems to be coming from the hard drive or the mobo around that area (gfx card and RAM are pretty close by too). I really don't think it's any of the fans. And the sound is ONLY there after it wakes up from Vista's sleep mode. -try booting up with the panel open (like, expose the innards so its all exposed to air). Does it still make the sound? Last edited by taptap on Wed Nov 28, 2007 5:21 am UTC, edited 1 time in total. You can physically stop a fan to see if it is that fan. Just while its whining, stick your finger on the center of the fan to slow it down to a stop, listen for a change and then let it go again. davean wrote: You can physically stop a fan to see if it is that fan. Just while its whining, stick your finger on the center of the fan to slow it down to a stop, listen for a change and then let it go again. Do this, but stopping certain fans will result in fan failure alarms (annoying PC speaker beeping, etc), depending on the computer/BIOS settings. Just don't keep the CPU fan stopped for long and you should be fine. Rather than making the computer standby, why not see if hibernation is an option? On another note, my computer used to make a noise like this at random moments in time. It doesn't anymore. Sorry that I can't help. Are you using a really cheap power supply? Like REALLY cheap? It's been a while, but I've heard power supplies make high pitched buzzing noises like the one you are describing. AC power cycles at about 60hz, and can cause a high pitched noise in some devices. Remember the sound older televisions and CRT's make? Power supplies (especially really crappy ones) might get confused when vista goes to sleep or something. I know its not a normal power off state. Maybe when you come out of sleep mode the PSU gets a bit cranky and starts making this noise? Just a theory. Listen near your PSU exhaust fan when this problem happens to see if thats where the noise is coming from. My mobo has a weird network port. It's the source of a random high pitched whine. I can't identify what starts/stops it beyond "only happens with a network cable plugged in". I've mostly just decided to deal with it until I build my next computer. Moral of the story: Lots of things can make a generic noise. Check lots of stuff. FACM wrote: My mobo has a weird network port. It's the source of a random high pitched whine. I can't identify what starts/stops it beyond "only happens with a network cable plugged in". I've mostly just decided to deal with it until I build my next computer. This might be the result of a cheap clock generator for the nic. 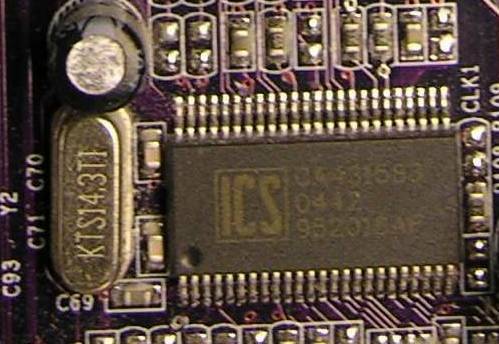 Clock generators look like little silver boxes with a small number of pins. They have a tiny quartz crystals inside that resonate at a set frequency. I don't know if they are capable of producing noise within the range of human hearing, but thats really the only thing I can think of. How's that for a retarded theory? This is what a clock generator looks like. Its the silver thing to the left of the chip. o0o0xmods0o0o wrote: Rather than making the computer standby, why not see if hibernation is an option? Hibernation works. But it boots up slower. tinyterror wrote: Just a theory. Listen near your PSU exhaust fan when this problem happens to see if thats where the noise is coming from. The PSU is cheap, but the sound seems to be coming from the area near the hard drives.